The West Michigan Whitecaps front office staff received their 2015 Midwest League championship rings Monday. The rings were designed and handcrafted by Grand Rapids-based Terryberry. 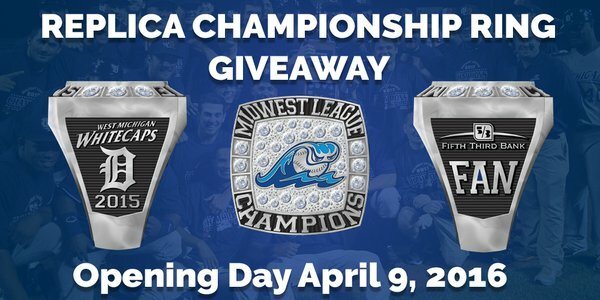 Each of the first 1,000 fans through the gates at West Michigan’s home opener on Saturday, April 9 will receive a replica of the championship ring. Last year’s Midwest League Championship Series lasted the maximum five games, with the Whitecaps beating the Cedar Rapids Kernels 3-2 in Game 5 to win their first MWL title since 2007. This entry was posted in 2015 Playoffs, Cedar Rapids Kernels, Midwest League, West Michigan Whitecaps. Bookmark the permalink.